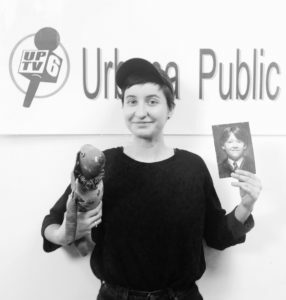 Al Schneider is a performance maker and theater researcher currently living in Urbana. Information about their work can be found here: alanddog.co.uk. Dressed in plaid, blue jeans, a ball cap, and boots, a laid-off, Born-in-Beardstown, down-and-out sort scratches his head, and asks the questions we might be asking ourselves. Or maybe it’s our uncle who’s asking the questions, or our mother-in-law, our co-worker, or just somebody we heard on the nightly news. 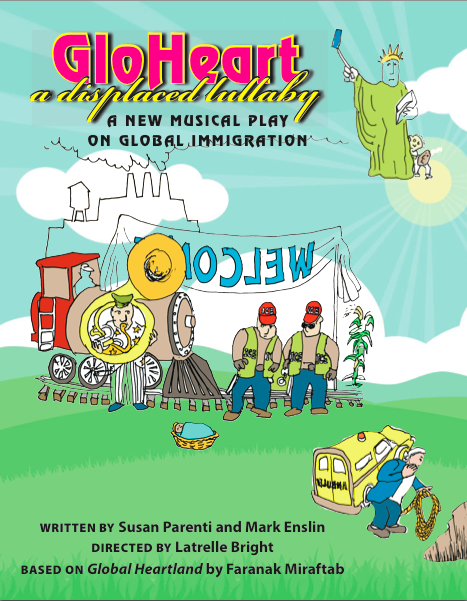 Whichever way, the protests of those who see themselves as suffering from the arrival of migrants to the United States—and central Illinois in particular—are not approached warily in Susan Parenti and Mark Enslin’s play on global and local immigration. Rather, GloHeart, A Displaced Lullaby makes a point of provoking a conversation around immigration which is sticky and requires its audiences to remain thoughtfully present throughout. 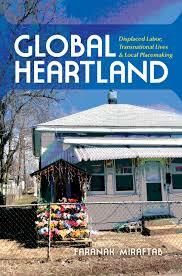 Based on the book Global Heartland: Displaced Labor, Transnational Lives, and Local Placemaking by University of Illinois Professor Faranak Miraftab, GloHeart takes its questions from Miraftab’s analysis of a meat processing plant in Beardstown, Illinois and its recruitment of migrant laborers. “What brings these diverse people to this part of the country?,” Miraftab asks in the introduction to her book. Pork slaughtering is neither easy nor pleasant work, and after Oscar Mayer closed in the 1980s over disputes with its unionized workers, the plant—subsequently under the ownership of Cargill, and now owned by JBS USA—was able to reopen without a union, and with far lower wages. After purchasing the plant in 1987, Cargill began actively seeking and employing immigrant workers. Initially, these workers came from Mexico and Central America and lacked documentation, but Cargill eventually began recruiting people from West Africa who had gotten residency through the so-called Diversity Visa Lottery, and hiring black Americans from Detroit. This influx of migrants to Beardstown was met initially with hostility, but is now presented locally as a success story. Beardstown has been revitalized by its new population, which has renovated houses that had fallen into disrepair and provided the economic growth necessary to building new services and infrastructure. Miraftab scrutinizes this simplified story of Beardstown. She presents an analysis of the conditions that led to the transformation of a small town with a history of racism into a home for a large migrant population, asking why migrant labor continues to be used in grueling workplaces and how these populations have been “produced” in the first place. These are some of the complexities which GloHeart presents in the form of a forty-minute play. GloHeart is not a work of dramatic theatre meant to incite sympathy for the plight of migrant workers. While each performance begins with a song welcoming newcomers to the United States, and gives insight into the more difficult aspects of emigrating from one’s country of origin, GloHeart is a play that asks questions before prescribing an emotional response, and it does so through the use and interrogation of language. In the first moments of the play we are presented with an overzealous movie director, whose interest in immigration as a potential for producing an “old Go West Young Man” story comically pricks at our nostalgic view of moving to a new land, and asks us to reassess how our ideas about immigration are informed by the language of mainstream media. In this particular scene, controversy arises during a discussion of pay among workers. John receives two dollars more per hour than his female counterpart for the same work. And Gayle, though she is new and works upstairs in the office, is making vastly more than those “on the floor.” My character, Carol, is outraged to find out that Longhi, the migrant worker, has accepted pay under minimum wage. “I was offered,” Longhi pleads, as Carol points her finger and lays blame for the decrease in wages on the person with the least control over her circumstances. Her rant is muted somewhat by the other workers singing as they exit the stage. The words used by Carol in the break room belong to a game of language being utilized in the larger conversation on immigration. We hear them in snippets, and for most of you reading this article, you—like me—likely scowl or shake your head in some kind of disapproval, brushing these words away, easily dismissing them as nonsense. To give these words the space to be heard, on stage, asks us to pay attention to language more actively, and if we can identify how language is being used to misplace blame and manipulate, perhaps we can work to create new sentences and new conversations. 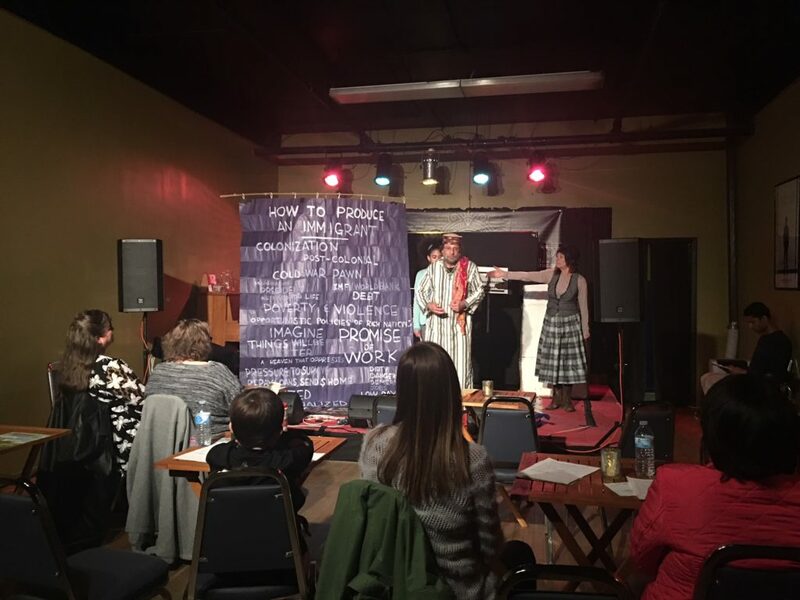 GloHeart, A Displaced Lullaby, written by Susan Parenti and Mark Enslin, is a project of The School for Designing a Society, which currently holds weekly seminars on immigration on Sundays from 4-6pm. GloHeart will continue to have performances throughout this spring, and will resume in the fall. If you are interested in being involved or have a venue in mind, please email Susan Parenti at susanroseparenti@gmail.com. Information about upcoming performances can be found at: designingasociety.org/blog/gloheart-displaced-lullaby/. This entry was posted in Immigration, labor. Bookmark the permalink.